Custom domain setup in Blogger.com is used to create your own blog URL. (for example: from myblog.blogspot.com to myblog.com). When you purchase a domain from Godaddy.com, they assign an IP address (A record and CNAME record) for the domain. Hence, you need to change those records to point to your Blogger.com blog. This post can help you to change the A and CNAME records of your Godaddy account. Login to your Godaddy account and click on the My Account tab. Under Domains, you will see the list of your domain names. Click on Advance Details of your desired domain. You’ll be directed to the Domain Manager page. Under the A(Host) Tab of the DNS manager, enter the 4 IP addresses as below, one-by-one, using the Quick add button, to change the A records. Click on the Quick Add button in the box labeled CNAME(alias). If you’ve already created a CNAME record for your blog’s address, click the pencil icon next to the existing CNAME record. After you are done adding records, click on Save Changes to save your edited data. For the Name, enter only the sub-domain of the address you want to use for your blog. For example, if you picked www.myblog.com as your address, enter www here. Enter ghs.google.com as the Host Name. Specify a TTL or use the default setting of 1 hour. how do we specify the http://www.mydomain.com to go to the myblog.blogspot.com ? which tells you how to setup a custom domain on Blogger. Hope this helps ! Very clear explanation with screen shots. The sub domain link was also very useful. Thanks Omkar! is it possible to do it on a folder under my domain? my domain already contains regular website. I want the mydomain.com/blog will contain the blogger blog.is it possible? Yes, that is possible. You can install a WordPress inside a /blog folder and then import all the content from blogger. I think without your this article it was impossible to setup my domain. ok so i did everything up to nr 5.
this is my very first time so i really don’t get it. If you don’t have CNAME record in Domain manager account, then add it www as host and point to ghs.google.com . I can see the domain redirection is working now. the A record setting can,t do by this ip,,, why??? Can someone tell me how I find the ip address for my blog on blogger so I can add my domain name? If you purchased a domain name from Godaddy then, you need to add above mentioned 4 IP addresses in Godaddy DNS manager section. really useful post, thanks a lot. I have done all the possible steps, but still blogger just give me the fail message: “We are not able to resolve http://www.example.com” when trying to publish they also provide me with a very long CName that’s not accepted by GoDaddy …any ideas ? You need to add both the CNAME records along with their value (www and other string) which you found in your blogger.com account. I had tried that but, Godaddy does not accept the string, show invalid warning. can i put all A name @ and what i do when some a nmae and cname exist initionly. buy the way A great post you shared. For the specific domain name you need to have only one A record for @. you write google provide us 4 server than what i do with these. recently i upgrade my domain but I don’t change the initialy provide server ip via godaddy and its work properly. thanks sir. Your content saved my money. Thanks alot. Well written and thanks for your guide… When i try to host name ghs.google.com it says Only one CNAME can exist for the hostname www any idea?? I set up my website with go daddy ( which took forever) and now I redirected my blogger blog to my site. Now my address just shows my blog not my site! I wanted the blog to be one of my pages on my site. Please help! Thank-you so much!!!! Can you please create a support topic here? also give us blogger blog and site URL, so we can cross check it. Go daddy actually fixed the original issue. But now I’ve tried to create a subdomain for the blog to go to and it now redirects to website which is now not showing! I just want to know is there a way to have my blog as a page in my website. If you are looking this for WordPress then, you can create a page and go to Settings -> Reading and assign that page. It’s not WordPress. Blogger blog and go daddy website. Thanks! but when u try to enter rootlk.com not working can you please give guide ? Add CNAME record for www as well. It will work. I have changed DNS records before and it worked but this time ALL I am getting 404 error messages and I dont know why? I checked the ip addresses and even pinged them but nothing seems to work. Someone please help. If the A records are correctly added, then cross check the value which you have added for www, I think there might be a problem. i did everything. but when i go to my website with new domain name, hypup.com, i get 404. That’s an error. why? You need to add A record as well for the domain name. The DNS updates takes sometime to resolve all over the world. So that could be the problem. Hopefully after sometime everything will work fine. very thanks for you info. i would like to get another help. i uploaded a custom favicon to my blog. not by coding. i uploaded it to the layout. its working well for internet explorer and firefox. but not with chrome. how can i solve this issue? i would like to let u know that i know very little HTMl and no other coding langs i know. You just need to delete the cache in your Chrome, but I’m afraid this query is not relevant to the article. We encourage only on-topic discussions. Thank you! Add www @ for A record or CNAME with domain name. google say i fill all in my Cname, it is true or false? Yes, you need to add that CNAME record provided by google. Hi .. I had bought a domain through Google Apps via Go Daddy. I configured my blog to point to this domain and everything worked perfectly. I then cancelled my Google Apps subscription since they were going to charge me more for other services like Email, Users, Sites – which I didn’t need. I am not sure why should my domain stop working if I cancellled my Google Apps service. 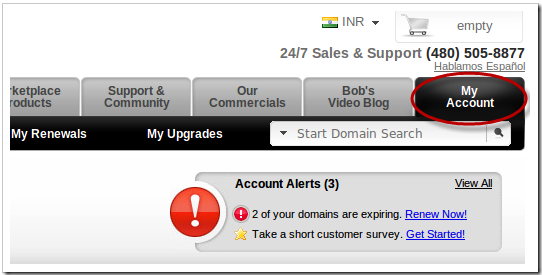 I am still able to log in to my GoDaddy DNS Manager and change all settings as I wish. Please ignore the above query…. It started working 24 hours after I made the change. Learned that its normal to take that much time for the DNS servers to get refreshed. Glad to know that Rahul. The domain is working now. In the A(Host) Tab of the DNS manager, there is already a value. Do we need to remove it and then enter the 4 IP addresses. or can we add the 4 IPs as additional values? Yes, you need to remove that A record which is default IP provided by godaddy and then enter those 4 IP of Blogger.com. Thanx for the post. I had done all these things, and is working fine too. But while entering adress without ‘www’ it shows error. is there any way to clarify that…? Make sure you have changed the www records as well in domain registrar like mentioned above. You need to purchase hosting from any other company or dh.rtcamp.com to install the WordPress. WordPress.org do not offer hosting service. Extremely clear clarification with screen shots. The sub domain link was also extremely helpful. Thanks Omkar! You can get in touch with our team, please contact us. When i changed blogger default url to custom domain then after nearby 9 days ago my traffic goes very down. Please tell me how can i solve this issue. Is your custom domain pointed to blogger.com DNS records? when i revert to blogger default url then traffic comes back. Yes, It is pointed to blogger.com DNS records, All the settings are correct. I’m very confuse about this problem. In that case get in touch with the domain registrar team, they can help you with the DNS OR its might be an issue with delay in DNS propagation. Make sure you have added all the CNAME records and A record in your godaddy account. Once it is done, wait 24 hours to propagate that domain world wide, then only change URL in your blogger blog. This will work fine. Hi and thanks very much for this turorial. I am very confused, though. I followed every step including adding the 4 IP addresses, adding www/ghs.google.com but that’s when I want to add the Blogger C-NAME that things block. In the column right below www I put “eaqdyckksalc” and in the next column, right under “ghs.google.com” I put “gv-ff44r32d3glcvv.dv.googlehosted.com”. seems like the other record already added to www under CNAME or under A records section. First remove that, and then try again. By looking at your post itself i had set up my blog. Thank you very much for this how to guide. Thanks for sharing this useful information ..i was searching this problem before 15 days……but today i saw your post and i feel that it a nice procedure…so thanks. Do you want to change the blogger URL from blogspot url to custom domain? If yes, then you need to point IP addresses (provided by Google) to your custom domain under your domain registrar. your instructions are very useful! just to confirm, i don’t need to enter my existing blogspot site on go daddy for my domain name to be redirected there? Its confirmed, you don’t need to add redirection of blogspot url in your godaddy account. I purchased a custom domain for my wife’s blogspot account. I see the things I need to do to point the domain via godaddy to the blogspot account and will do that some time this weekend. What I need to know, I pay for a reseller webhosting account and can host my wife’s email but can this be done? Can I point the www custom URL to blogspot but have her custom domain email hosted elsewhere? (i.e. email@customdomain.com hosted for her by me and http://www.customdomain.com pointed to her wifesblog.blogspot.com account?) Thank you in advance. Yes, you can use the custom domain with blogger blog. Just change the A and CNAME records in Godaddy account. For email account also you can use other hosting provider, add MX records provided by mail hosting. This was a great help for me. Thanks a lot for posting! I have changed blogger default url to custom domain name then after some days my traffic going %60 down. My new domain entire posts url are index. All the settings are correct and there is no issue with delay in DNS propagation. Please suggest me that how can solve the problem. Please cross check in webmaster tool if there are any errors. Also submit the change of address in it. There are no errors showing in webmaster tool. At this time in webmaster tool I have old blogger url and custom new domain and in blogger old url showing in change of address section that Restricted to root level domains only. I am very new and do not have any previous experience of web hosting etc. I found your article very helpful but there is a difference in the view i can see in my godaddy account. So unable to get benefit from the information here. If you just want to change the blogspot domain to custom domain, then for that you don’t need to purchase web hosting. Just need to point custom domain to Google IP and change URL in blogger settings. Add CNAME record also for www, it will work fine. Hi, i read this post about setting domain name in blogger. If any body suggest me that ,do i need must be buy domain name or if i use blgospot.com any problem? i have changed my blogger domain to custom, and my traffic is also down upto 90 % ..Before 2 days it was normal..Does the search engine takes some times to get back my site into its own position or there is something wrong wid me? Make sure all the blogger posts and feed URL redirecting towards WordPress and you have submitted the sitemap in webmaster tool.